The Barefoot Navigator? We hear you ask.. The Barefoot Navigator. No shoes, no gadgets, no worries. Picture a a sailor, lost at sea. Frantically searching for their chart plotter. Pulling out their iPad, holding it up to view their Navionics application. Although handy, the Barefoot Navigator does not need to rely on these tools because he/she knows exactly where they are. Barefoot Navigators can read the tides, understand the wildlife and be guided by the stars. By taking a look at the conditions around them, they can figure out exactly where they are. In a world where we seem to have become reliant on technology instead of the world we live in, the Barefoot Navigator encourages us to re-connect with nature. Using the skills of the ancient navigators, we can reach our final destination using limited technology. BOSS has co-developed the Barefoot Navigator, our brand new Navigation course to enhance your senses and use the world around you to plot your course. We are taking you back in time to learn ancient techniques, while helping you reach your destination as efficiently as possible. So you can enjoy the modern world using the wisdom of the greats. 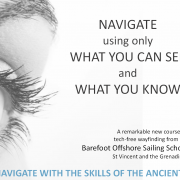 Alongside Jack Lagan (Author of the Barefoot Navigator), we will offer this exiting new course that will teach the seafaring techniques of the ancients, all while helping you enjoy the best of the islands. So, we will be gaining new skills and understanding the world around us. Most noteworthy, we will be taking back control of our own navigation. We will learn to navigate by understanding “Horizon Events”, swell directions, the native birds, the stars above and will probably have the most fun than we have ever had in nature. It seems only right to invite new and old sailors alike to come join us as we rekindle the ancient navigation flame. Wishing you all Beam winds and star-filled skies. Have you Ever Dreamed of Crossing The Atlantic Ocean?